Microsoft unveiled Windows 10 at an event in San Francisco today, lifting the lid off the highly anticipated Windows upgrade, though not under its expected name, before a gathered group of journalists and analysts. Microsoft's Terry Myerson said the new Windows needed to be built from the ground up for a "mobile-first, cloud-first world," the mantra Microsoft has adopted ever since CEO Satya Nadella took over. To that end, Windows 10 will run on more types of devices than ever before, and Microsoft will bring forth a single application platform, complete with one integrated Store, to deliver Windows experiences across products. Myerson called Windows 10 "our most comprehensive platform ever." The OS is scalable across devices big and small, and developers will only need to write one universal app that targets all platforms. Everything from the Internet of Things to data center servers to devices with 4- or 80-inch screens (or no screen at all) will be able compatible with the new version of Windows. Check out full Windows 10 hands on review! Beginning tomorrow, Microsoft is launching a Windows Insider Program to give advanced PC users and IT managers access to the Windows 10 Technical Preview. In early 2015, Microsoft will shift the focus to the consumer side of Windows 10, and its full release will happen later in 2015. With Windows 10, Microsoft is moving toward one product family that features a tailored experience for all devices rather than superseding a single UI across machines. It's also introducing - or reintroducing - a number of features to help optimize the experience for both keyboard and mouse users and those more accustom to touch. 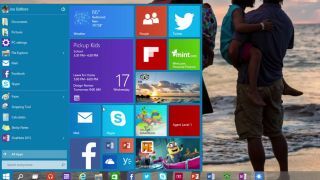 For starters, the Start menu is making its return, though this time it includes a new customizable space for users to put their favorite apps and Live Tiles. Instead of the whole screen being littered with Live Tiles, they now live adjacent to the Start menu. Windows 10 has some clear hark backs to Windows 7, by design. The company wanted to give users something familiar to work with, a complaint that plagued the jarring changes of Windows 8. For example, the traditional Windows 7 Snap View works in classic and Universal Windows 10 apps. "We want all these Windows 7 users to have the sentiment that yesterday they were driving a first-generation Prius, and now with Windows 10 it's like a Tesla," Joe Belfiore said. Microsoft also sought to make its OS more novice-friendly to help them multitask better on the platform. A new "task view" button occupies a space in the task bar and lets users switch from app to app and access any desktops they have open. The desktops have mini-views along the bottom of the screen, giving users quick access to whichever one they want to work in. Multiple desktops can run simultaneously for different purposes and Microsoft assured switching between them would be easy and effortless. A new Snap Assist UI lets users grab apps from various desktops, pulling them onto their screen in a full-screen view, divided in up to four sections. You can have Bing search along the bottom, a Word doc on top, a PowerPoint to the side and your finder open below it. All apps now runs in a window, so apps from the Windows Store will open in the same format as ones from the desktop, and they can be resized and moved around to users' likings. Title bars along the top let users maximize, minimize and close the apps with a click.